1466: Louis XI decides to set up a silk manufacture in Lyon. 1536: Two Italian merchants, Turchetti (his French name was Etienne Turquet) and Naris, set up a silk workshop in Lyon. Turchetti founded a school where Italian silk winders or spinners taught their skill to local poor young girls. 1540: Francois I, King of France, granted the monopoly of silk manufacturing to the city of Lyon. After 1540 all fine silks coming into France from Italy or East passed through Lyon's warehouses. 1605-1620: Claude Dangon, a master weaver, improved loom technology of the Italian loom named "métier à la grande tire". In 1620 there were more than 10,000 looms in Lyon. 1667: Colbert, the superintendant of finance of Louis XIV, regulates the silk industry. 1685: The Revocation of the Edict of Nantes causes the French Huguenots to flee the country in large number. Many were experts in the textile industry and they contributed to the development of the silk industry in Germany, Great Britain, Italy, Netherland and Switzerland. 1685-1715: The end of the Louis XIV reign brings war and poverty. The silk industry is threatened by the increasing scarcity of royal orders and by financial problems. 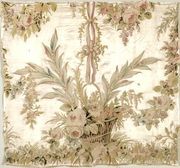 1726-1730: Important orders by the royal "Garde-Meuble" for the decoration of the king's apartment are the beginning of significant developments in the silk industry that last until the French revolution. 1756: Creation of the free royal school of drawings by Lacroix. 1786: The number of looms is 15,000. 1789-1797: The silk industry is almost completely destroyed by the French revolution. Thousands of its inhabitants were to be guillotined or shot. Much of its skilled labor disappeared. Most of the drawings, designs and fabric samples that were the glory of Lyon were destroyed. In order to survive many fled to England, Russia, Italy, Switzerland, Spain, Germany. In 1797 the number of people working for the textile industry in Lyon was reduced by 90%. 1801: Joseph Marie Jacquard invents a mechanical loom controlled by pasteboard card with punched holes, each row of which correspond to one row of design. 1802: Bonaparte and Josephine's visit to Lyon marked the beginning of the reconstruction period. 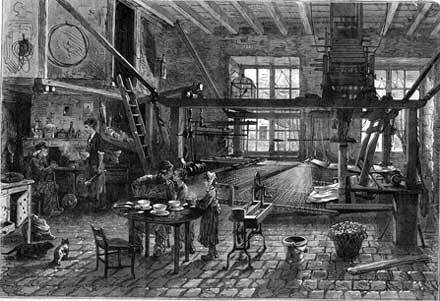 1820-1824: First weaving factories and beginning of industrialization. The silk industry in Lyon reached its peak in the 19th century. 1880:The slump of the export silk market revealed that the silk industry in Lyon was maladapted to the new mass market. In response many companies heavily invested in new machinery and had to merge with competitors. From 1870 to 1914 the number of mechanical looms multiplied by eight! The use of Asian silk blended with different material such as wool became more comm0n. One of the strenght of Lyon: the birth of multi-talented designer entrepreneurs. The combination of artistic and technical creativity is probably the main cause that made Lyon one of the world capital of the silk industry in the 18th century. In 1759 there were 55 fabric designers, 80 in 1790. Many worked anonymously and their names were forgotten. Few information is available except for those who were at the same time painter, entrepreneur or technician such as Bony, Revel, Dugourc and Lasalle. Jean Revel ( 1684-1751) produced a number of chinoiserie silk design in early Rococo style from the mid-1750s. Pierre Ringuet (1698-1771) was the son of a master carpenter and architect who worked free lance for different workshops. 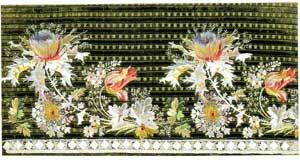 He would have been the first one to introduce natural flowers in the fabric design in Lyon. Courtois, Quoted by Nicolas Joubert de l'Hiberderie as the fisrt one to introduce shaded tones. Joubert de l'Hiberderie ( Paris 1715- Lyon 1770) . Worked for Pernon as a chief designer. He wrote Le dessinateur pour les etoffes d'or, d'argent et de soie", Paris, 1765. Jean Pillement (1728-1808) Born in Lyon he had a very cosmopolitan carier. He was a paineter and designer known for his landscape and chinoiseries in the Rococo style. He engraved fanciful chinoiserie design that were drawn upon by other tetxile designers in his One hundred and thirty figures and ornaments and some flowers in the Chinese style, London 1767 . His design were used by English cotton printers and by Oberkampt factory at Jouy. Philippe de Lasalle (1723-1804) was one of the most successful designer-manufacturer-inventor in the world-renowned silk manufacturing centre of Lyons during the ancien régime. Joseph Bourne (1740-1808). Flower painer and textile designer. Joseph Gaspard Picard (1748-1818) was born in Louhans in 1748. He was higly esteemed in several Europeans countries, especially in England. One of his designs is exhibited at The Boston Museum of Arts. Antoine Berjon (1754-1843). Flower Painter and designer. He was a teatcher of flower design at the Lyon Ecole des Beaux-Arts. from 1810 to 1823. The silk industry of the 19th century produced much less creativity in its designs. Simon Saint Jean (1808-1860) : studied at the Ecole des Beaux-Arts in Lyon with flowers painters Augustin Thierriat and Francois Lepage. Worked for Didier- Petit. Jean Etienne Grand. One of the two brothers of Maison " Grand Fréres" . He was a painter and a textile designer. Descendant of the well-known Silk Producer he was the chief designer of Lamy- Giraud in 1880. Well known for his style Louis XVI . In the first half of the 20th century famous artists such as Sonia Delaunay, Raoul Dufy , Paul Iribe, Charles Martin, Robert Bonfils, Paul Mansouroff, George Barbier, E A Seguy, Benedictus, Karbowsky, Clarinval, Henri Gillet and Michel Dubost designed fabrics for the Lyon silk industry. Nicolas Joubert de l'Hiberderie : Le dessinateur pour les etoffes d'or, d'argent et de soie", Paris, 1765. Musée des Tissus et des Arts décoratifs, Lyon : They house more than two million of pieces of fabric. Unfortunately very few are exposed: a very conservative thread runs through Lyonnais culture as can be witnessed by the scarcity of fabric displayed by the museum for fear of being copied. Excellent Library opened every afternoon from Tuesday to Friday.